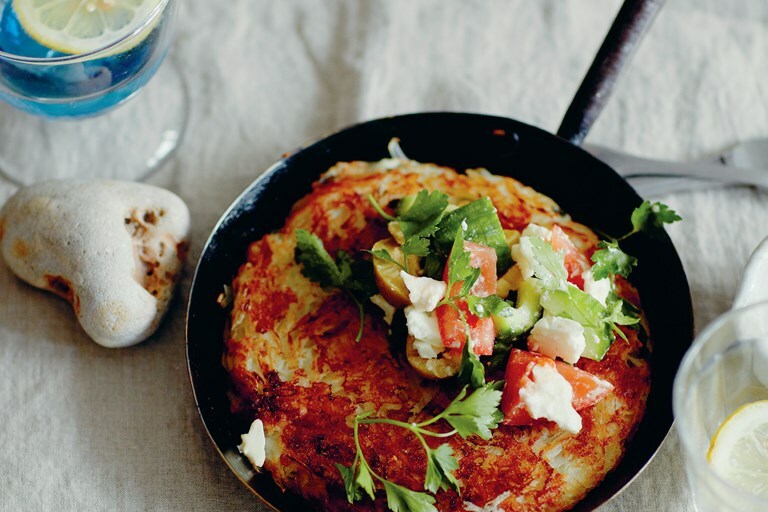 TV presenter and chef John Torode has perfected his potato rösti recipe and serves it with a fresh Greek-style salad. Easily multiplied, this is a simple potato dish at its best. By definition a rösti is made and cooked with raw potato, but this recipe is one that I have honed over the years. By pouring boiling water over the grated raw potato it scalds it and washes away some of the starch, so the cooking is just a little less temperamental and quicker. Some might say it’s not a true rösti but in my books, if it works, go for it. This recipe makes one large rösti or 2 smaller, thinner ones, to feed 4. Serve with whatever you wish, from fried eggs to ham and cheese. And if you make thin ones, roll them up with a frankfurter inside. Bad I know, but I never said anything about healthy food!